Today marks International Orangutan Day; a day to encourage everyone to take action to protect the rainforests which are home to these amazing animals. 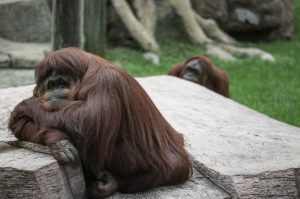 Did you know that the Bornean orangutan population has decreased by half since 1999? Or that a new species of orangutan discovered in Sumatra in 2017 is already endangered? It probably won’t come as a surprise that human consumption of palm oil is to blame and, sadly this is on the increase. I honestly didn’t know that palm was as prevalent in pretty much everything we buy until I read the last issue of Ethical Consumer magazine and did a bit of research for this blog post. In 2014, the EU used over 7000 metric tonnes of palm oil and there was an increase in palm oil was being used for biodiesel. 45% of the total amount of palm oil used went towards this, with 15% on energy and the remaining 40% on food, feed and industrial use. Palm oil is the greatest threat to orangutans because their habitats are being destroyed to produce it. 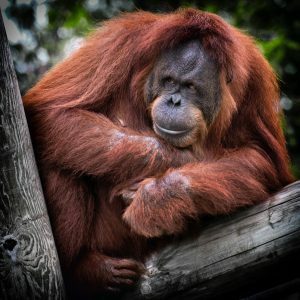 We lose 25 orangutans every day. Animals including orangutans are injured, killed or displaced when deforestation occurs. Deforestation also increases the accessibility to wildlife smugglers and poachers, creating an additional threat. Mother orangutans are often killed so that their babies can be taken away and sold as pets or as entertainment for tourists. This week, Greenpeace released an animated video which I urge you to watch and share using #SaveRangtan and #StopDirtyPalmOil. 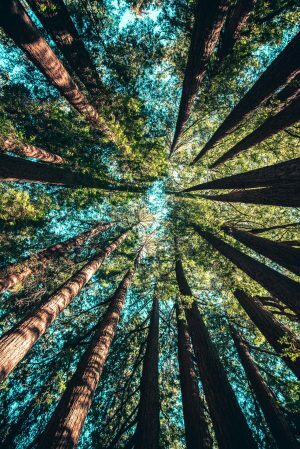 There is also a petition you can sign calling for action on deforestation. Consider joining Greenpeace, or another organisation, to help them in their vital work. Avoid products that contain palm oil. Be an activist – we all have a voice and you can use yours to raise awareness. Pre-order a copy of the book to accompany the Greenpeace video and share it! Email supporter.uk@greenpeace.org for a copy and pay postage costs only. My daughters love theirs. I’d love to know what you think of the Greenpeace video, let me know in the comments! Are you signed up for my monthly newsletter?